Through my research, I discovered that atoms, cells, and matter surrounding us are constantly making beautiful geometric patterns in resonance with the sounds that surround us every day. After breaking down notes, songs, words, wind and even light you are left with frequencies. Early artists such as DaVinci and Galileo often used various frequency patterns in there works on churches, one being The Rosslyn Chapel in Scotland visit link. Ernst Chaldni was a musician and physicist, his most well know discovery was vibrational patterns of sand/ salt formatting on plates, they are now known as Chaldni Figures click here to view video. For a more up to date study on cymatics visit link Seeing Sound a thesis written by Stephen Lewis. Evan Grant has a detailed Ted Talk on cymatics and the formation of sound, Making Sound visible through Cymatics. Extensive research into acoustical physics and has been documented by John Stuart Reid, a lecture that was filmed in 2006, please visit link, The Shape of Sound. The University of Bristol, Dept. of Computer Science have made some exciting discoveries. Research is being led by Dr Ben long, they are creating 3d virtual touch ultrasound, all this is possible because of frequencies.Please visit link to see video. All this research backs up my theory that everything has a frequency, and is vibrating in order for the universe to communicate with all and everything, order and chaos in space and time. I am starting to look at the effects of frequency on the inside of the body I have come across some fascinating research in how our cells communicate through frequency. Take a look at this paper written by Matthias Schneider, Boston University, Can Cells Signal each other via Sound Waves? Lifes Rhythms by Mickey Hart is a musician and Dr. Adam Gazzaley is a neurologist who have been working with Emotiv to create Brain-Computer Interface which creates rhythms in response to brainwave activity, this kind of research and work really excites me, having an understanding of how the brain works and how someone in a coma state could continue to communicate with the outside world is a very exciting advance indeed. I have begun to have a new and expanded interest in searching into other forms of music such as Binaural Beats, which is rhythm. Scientist Melinda Maxfield, PhD, extensively researched rhythms used during rituals of ancient cultures and found that they generally beat at a steady rate of 4.5 beats per second. This consistent beat induces a trance-like state for tribes, due to the brain shifting into a 4.5 beats-per-second brainwave frequency, which is a low Theta brainwave state. Andrew Newberg, a neuroscientist at the University of Pennsylvania, and author of “How God Changes Your Brain” discovered that while we are deep in prayer or meditation, activity in our parietal lobes drops to almost nothing. The parietal lobe is responsible for sensory awareness and orients us in the world. Newberg believes that the drop in activity during meditation and prayer explains that sense of oneness we feel when in a deep meditative state. For example: if a 200 Hz sound frequency is sent to the left ear, and a 205 Hz to the right ear, the brain will process those two frequencies and perceive a new frequency at 5 Hz. 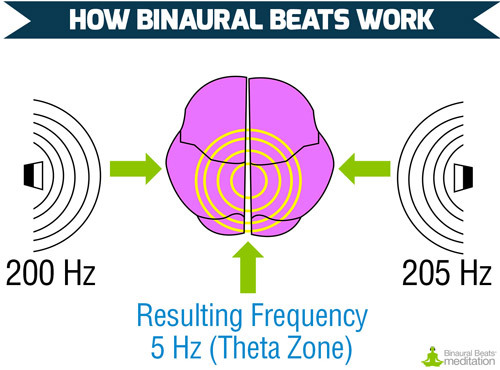 The brain then follows along at the new frequency (5 Hz), producing brainwaves at the same rate of Hertz (Hz). The technical term for this process is ‘frequency following response. So this shows that even the rhythm of a sound piece has a value on the person’s wellbeing and also how the human ear reproduces the sound to the brain. I have been listening to examples of this work to get an idea, click here for an informative website about this topic. Whilst reading through Lab Times I came across an article Musical Biology, Turning Data into Sound which is what Daphne Oram, Max Mathews and also Brian Eno have been doing. This is definitely a technique and process I will be using in my work in the near future.